White Chocolate Grill is a modern, high quality restaurant combining upscale atmosphere with a sophisticated American menu. In-house, made-from-scratch preparations give each dish a unique touch. The menu features such items as: Filet Mignon Cobb salad, Prime Rib French dip, and Wood-Fired Citrus-Soy Glazed Salmon. Subdued lighting, comfortable booths, and friendly knowledgeable service all add to your dining enjoyment. Finish with one of the restaurant’s signature white chocolate desserts and complete your truly memorable dining experience. 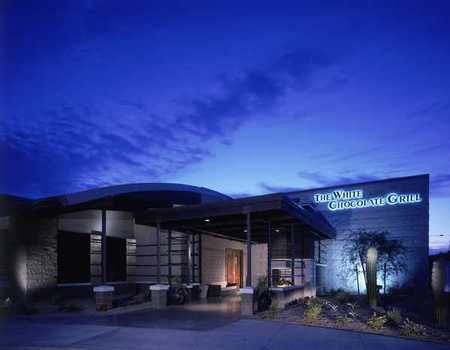 The White Chocolate Grill resides in the Scottsdale 101 Shopping Mall, and is strategically located at the corner of Scottsdale Road and Mayo Boulevard. The concept of an upscale American grill is the brainchild of the owners of the famous Cinzetti’s Italian restaurants in the Midwest. Since opening its doors in 2005, these same owners have established a modern dining concept at the White Chocolate Grill, bringing to the table a broad contemporary American menu with signature white chocolate desserts. Before entering the White Chocolate Grill, I noticed the outdoor fireplace which belies an upscale contemporary theme. As I stepped inside, the interior immediately exceeded my expectations. Front entry walls of faux stone mix with dark wood paneling, a back brick wall and a glass enclosed open kitchen. Dark wood booths are elevated, with black leather seats far enough apart to carry on private conversations. Black rectangular shaped stands sit above raised booths and incorporate a minimalist Asian touch. Towers of silverware place settings rolled in white linen napkins are artfully stacked atop these Asian inspired platforms. Function meets form as place settings are removed from the stands to the tables when guests are seated. Touches of red accents in lacquered vases, large dried flowers and ceramic rings complete the décor. The eclectic mix of unique textures, colors, and styles come together seamlessly to create a contemporary ambiance. Adding to the elegant atmosphere, the bar is strategically placed at the southeast corner of the restaurant, just off the beaten path from of the dining room service. The beautiful back wall of the bar is comprised of an artful display of three tiers of bottles, arranged by color and is displayed for guests in the main dining room to enjoy. Red, white, blue, green, and auburn bottles are stacked in ribbon-like columns glowing with black lighting. The result is pleasing to the eyes without being overpowering. Bar seating includes tables and comfortable chairs set on raised platforms that are tiered, allowing all patrons an unobstructed view of the gorgeous glass display. TV monitors are set high above the bar, adding to the trendy vibe that resonates throughout the lounge. This bar is ideal for leisurely socializing and also accommodates intimate conversations. The bar offers the full dining room menu as well as a separate menu with lighter eating options. Walking through, I could see that the back center of the restaurant leads to a beautiful screened patio, which offers seating for up to forty-eight guests with a central fireplace and strategically placed heaters. 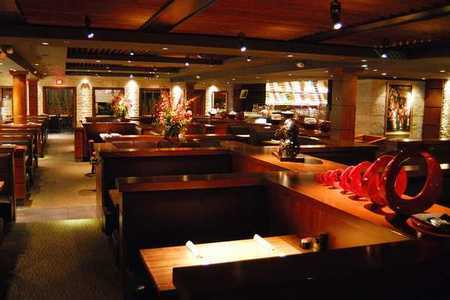 We were lead to our table in the main dining room, which was full of comfortable seating options and stimulating décor. Upon being seated, our hostess noticed our black attire and neatly replaced the white cloth settings with black ones, ensuring, she explained, that no white lint would mar our clothing. This added touch suggests that each dining experience is precisely orchestrated, with nothing left to chance. Our server, Elise, introduced herself and quickly proved to be professional, friendly and knowledgeable about the menu, informing us that every dressing, dip, sauce, gravy, and marinade is created from scratch. She informed my guest and me that every entrée is taste-tested by the staff every day. If something isn’t up to par it is made again, until it meets their professional standards. She provided perfectly timed service throughout the evening. Once we settled into our seats, she started us off with a glass of Evolution #9, from the Soklol Blosser Winery in Oregon. The white blend was slightly sweet with hidden notes of ripe apples, encompassing a crisp and refreshing flavor. Our first course, the Tomato Gin Soup, enticed us with its name and we had to give it a try. We were told it is one of the owners’ Italian family recipes. This house specialty is thick and hearty with so many different chunky ingredients that it’s almost a challenge to get a bit of everything in one spoon. This is anything but typical “tomato soup.” The base starts with fresh tomatoes and cream. Added to this are substantial pieces of bacon, mushrooms, chives, thyme, and herbs. To top it off, a generous portion of Tanqueray Gin floats on top. The menu declares that a diner “must be 21 to enjoy,” which is understandable at first taste. The gin adds a distinct “adult” flavor to the creamy broth. The Sesame Crusted Ahi Tuna is a very generous serving, seared and served with a red pepper, cabbage and mango slaw, dressed with curry vinaigrette, then glazed with a citrus soy dressing. It came with a side of wasabi to add spice to preference and ginger to cleanse the palate between courses. When eating the Ahi together with the slaw, dressing, and sides, I experienced an impeccable blend of sweet and savory that was pure delight. It’s wonderfully seasoned without losing the natural flavor of the fish and the dressings add an element of complementing color. Our entrees arrived soon after. The 6.5-ounce Parmesan-Crusted Filet (larger size available) was cooked medium rare. This steak is a great choice for parmesan lovers! The thick golden brown parmesan crust covers the tender grilled fillet. The steak was accompanied by a side of Honey Roasted Carrots that were sweet and delicious when finished with melted honey-butter. The filet was one of three featured on the menu. Elise reminded us that all their meats are hand-cut. The Barbecued Baby Back Ribs are marinated overnight, grilled, and finished with their own in-house barbecue sauce. The result is thick, fall-off-the-bone-tender, smoke-flavored ribs. The accompanying side is a seasonal specialty: Cold Green Beans doused in champagne vinaigrette and served with crushed pistachio nuts. The vinaigrette covering the lightly sautéed green beans created an unbelievably fresh and flavorful component. So rich in flavor, this amazing side dish could easily star as its own meal! The Spit Roasted Turkey French Dip is made with fresh turkey breast marinated in buttermilk, and roasted on the rotisserie daily. The meat is shaved, and served on a French roll with jack cheese. Accompanying the sandwich were The Freshly Mashed Potatoes with Good Gravy, another mouth watering side dish made from scratch. Boiled potatoes are combined with butter, heavy cream, salt, and pepper, and then carefully concocted so that the mashed potatoes hold their shape so as not to become flat or mushy. The potatoes were served with warm savory gravy made from fresh-daily rotisserie pan drippings of turkey and chicken. Additional seasonings are added to make the gravy remarkably delicious. With a name like White Chocolate Grille, our expectations were set high for the dessert menu. The White Chocolate Raspberry Cheesecake, made with airy cream cheese, and swirled with raspberry puree was amazing in appearance and taste. The tang of the cream cheese complements the sweet taste of the raspberry puree. A second layer of sour cream filling enhances the distinct layered flavors and the entire dessert is topped with whipped cream, additional raspberry puree, caramel sauce and white chocolate. The White Chocolate Banana Cream Pie is made with a heavenly graham cracker crust infused with white, dark and Belgian chocolate. The texture of the creamy center with chunky portions of bananas balances the firm crust and adds a big bite of fruit flavor. It was all topped with whipped cream and to no surprise, delicious white chocolate! The restaurant proudly serves a gluten free menu. They have worked closely with the Celiac Society and have taken the time, effort and research needed to deliver precise controlled offerings. A glance at this special request menu will verify their offerings are more than just a few token items. Most dishes on their regular menu can also be ordered gluten free. The menu has become so popular that health conscious eaters without dietary restrictions often ask for the gluten free menu. For diners who have a hard time making decisions with so many menu options, a “prix fixe” menu is always presented to dinner guests along with the regular menu. The set course offerings are available every day after 4:00 p.m. Referred to as the “Date Night Menu” the prix fixe menu includes an appetizer, salads, two entrees and a Dessert for Two. All menu options are full size portions and the choices are all taken from their regular nightly menu. We came away from our evening at the White Chocolate Grill replete, satisfied, and pleasantly surprised by the excellence of their gastronomic offerings. The genuinely welcoming staff made our visit feel truly appreciated. White Chocolate Grill’s incredible menu items, various seating options and captivating atmosphere establish an enjoyable and more than satisfying dining experience. Before even leaving the restaurant, we had certainly intended to return often with friends and family, convinced that the fresh eclectic menu has something even the most discriminating palates will enjoy. Main Dining Room | Happy Hours 2 p.m. - 7 p.m.
Main Dining Room | Happy Hours 2 p.m. - 5 p.m.
Fresh from CA. Parmesan dusted and served with aioli sauce. My wife and I were pleasantly surprised from the minute we walked in the door to taking our last bite of Banana Cream Pie. We have since been to WCG many times and have never had a less than wonderful experience with the food selection, (everything is tempting) the service and the setting. Prices are very reasonable and really feel we get our moneys worth. You have to try the WCG brownie also. An above average dining experience with excellent food and ambiance. You cannot go wrong with their menu, everything is a knock out (at least from what I sampled, and that was a bit!). I still rave about their deserts which seem to be better than the next, catering to those with a more reserved taste for sweets and those who need that unrestrained dose of chocolate goodness. I had a very good time here. I have previously spoke on the phone and filled out a survey card on our dining experience While the food was good, I was VERY dissapointed in the experience. I was celebrating a very important wedding anniversary and asked for a nice table when the reservation was made and then again when I confirmed the reservation. We were seated in the middle of the resturant (very noisey) and our anniverasry was never mentioned by anyone.